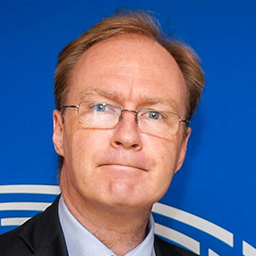 Sir Ivan Rogers KCMG is a former senior British civil servant, who was the permanent representative of the United Kingdom to the European Union from 2013-2017. Rogers served in the Treasury, including as private secretary to Kenneth Clarke, Chancellor of the Exchequer. He was then seconded to the European Commission as chief of staff to Sir Leon Brittan, returning to be director, European strategy and policy, and later director of budget and public finances under Gordon Brown. In 2003, Rogers was chosen as the principal private secretary to the Prime Minister, Tony Blair. After three years in this role, Rogers left the civil service in 2006 to become head of the UK Public Sector Group at Citigroup. In 2010, Rogers transferred to be head of the Public Sector Industry Group, UK and Ireland, at Barclays Capital. In 2012, Rogers returned to the civil service as the Prime Minister's adviser for Europe and global issues and the head of the European and Global Issues Secretariat, then becoming the senior British diplomat at the EU in 2013. Following the Brexit referendum in June 2016, Rogers became a key civil servant in the negotiations to leave.